Buy Heather Hills 100% Raw Spanish Lavender Honey 340g in the UK from our online shop or directly from our independent Scottish store. Lavender honey has a long, dry finish like a crisp, summer white wine that lingers in the mouth. A beautiful, fresh taste that evokes memories of long, languid summer days next to the sea. Simply use this in desserts or cocktails to make the most elegant of cheesecakes, ice creams and tipples or drizzle over goat's cheese or any other soft to semi-soft milky, white cheese. We sell real Heather Hills and other Honeys directly from our shop in Scotland and online throughout the UK. View more products from Heather Hills. Where can you buy real Lavender Honey safely online? If you are wondering where you can buy Heather Hills 100% Raw Spanish Lavender Honey 340g safely online in the UK, then shop with us. 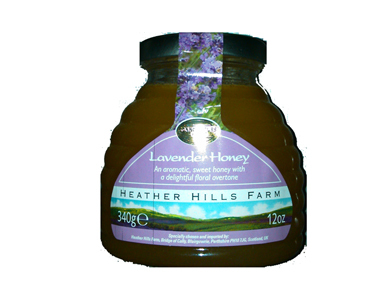 Lavender Honey - Heather Hills 100% Raw Spanish Lavender Honey 340g in Honeys and Honeys, Jams & Spreads.